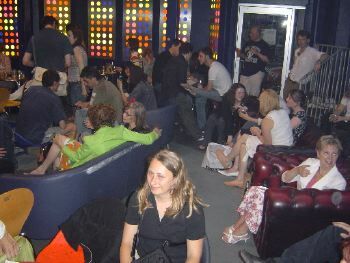 Last night many Samizdatistas heading for Aldwych as the 2004 Big Brother Awards were held at the London School of Economics. The list of winners, who are in fact losers, can be found here1. This was probably the best propaganda shirt I saw! 1 = Update: The link to the Big Brother Award details has been changed, which is not very clever. Link updated to a somewhat less informative page. Surely they had to give something to David Blunkett? 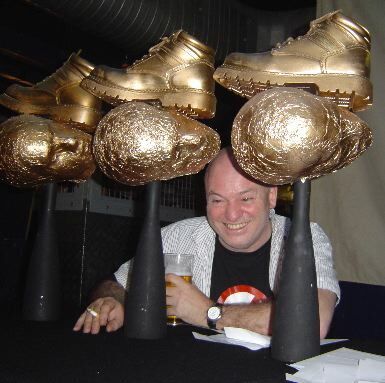 They did, Michael: The “Lifetime Menace Award”, of which he is a previous winner–a suitably tasteful representation of dog-poo on a stick–has this year been renamed the “David Blunkett Lifetime Menace Award” in his honour. Blunkett won so many times they changed the Lifetime Menace award to the “David Blunkett Lifetime Menace Award”. 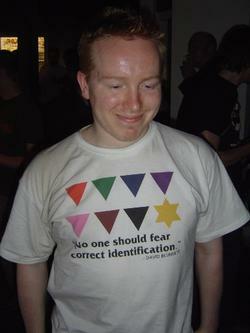 I must own one of those “No one should fear correct identification” t-shirts. Indeed, I could go for a dozen of those ‘correct identification’ shirts! Are they available from the originators or must we improvise our own? Yup – best T shirt so far. Simple design, strong message. One that I could bring myself to wear. Maybe I’m being thick but I didn’t understand the graphic on the T shirt. Is it a medal? Star of david? What’s with the British Gas win? PI have these brilliant awards, fighting the good fight against state intrusion into people’s lives, then give an award for “Most Invasive Company” to British Gas for failing to pass on a customer’s private financial information to the state? Am I missing something here? If PI are going to say that British Gas’s claim that their lack of action was caused by the Data Protection Act is unfounded, I want to see some evidence of its unfoundedness. They don’t provide any. I used to work for British Gas, and once spoke to a customer who complained that people were stealing her gas. She knew, because she could hear them under her floorboards at night. And she was far from the only insane customer I dealt with. I know for a fact that British Gas used to pass information of these sorts of calls on to Social Services (because my older colleagues could remember doing so), but, by the time I was there, they had been forced to stop by the Data Protection Act. I’m not defending them out of any sort of loyalty, by the way: they were dreadful employers and I was glad to leave. But this is a case of government intrusion (the DPA) forcing a company not to ask for government intrusion. British Gas deserve to be criticised for this one, but not for invading the couple’s privacy. Guy, Joe: That’s so sweet of them. Glad to hear it. Squander Two – good point. And how did Capita (?? – think that’s the name) manage to lose out? They were serial winners in the past. These are the collection agent for the BBC’s Licence (To Lie And Manipulate Facts And Disguise Editorials as News) Fee. They target by post codes. The assumption is, the poorer you are, the less mental and education resources you have to fight them. They are especially vicious about extracting money from single mothers and they prosecute them right into prison, with the children being taken into care. If you live in SWI, it is most unlikely that they will trouble you. Capita is the jackboot’s jackboot. Le ne plus ultra of government-backed intrusiveness and sheer, brute bullying. Perhaps they didn’t win this year because, after so many triumphs in the past, they have been retired to the Government Bullies’ Hall of Fame. Thanks Perry. All too clear now. Man…I want one of those t-shirts! I’ve seen the link regarding that identification t-shirt, and I still don’t get it. Is someone recently quoted as making that statement? Otherwise, it’s just an anti-Nazi shirt which is SOOOO 40’s, isn’t it? If you click on that picture, you can see the shirt rather more clearly. Clever t-shirt that…very effective in getting the points across. Shirley Knot: the t-shirts are available from the originators (me) at the link under the photo. Here is a direct link to the Blunkett quote on TheyWorkForYou. Instead of having to subject yourself to the uk parliament site. The ‘list of winners’ link appears fubar’ed to me. I think you want this instead. I think most people here (and a lot of no2id-ers) like the “no-one need fear…” T-shirt. I do myself. (I yield to no one in my contempt for New Labour’s totalitarian mindset.) But on reflection I have some doubts as to its effectiveness outside liberati circles. Just too much knowledge and brain required for the fleeting glimpse by the average punter. To get it one needs to know who David Blunkett is, about Nazi concentration camp badges, that there is a proposed id-card scheme that Blunkett is pushing, and read the quote, and connect it ironically with the idea of people being “identified” by an oppressive state and rounded-up accordingly–all in a few seconds. Many people who manage the first four will fail the last step bacause they won’t see an analogy between lovely trusty Britain and the Nazi tyranny. It is great in other words for preaching to the converted. In the last few days I’ve been giving a lot of thought to preaching to the unconverted but potentially converted, for obvious reasons. 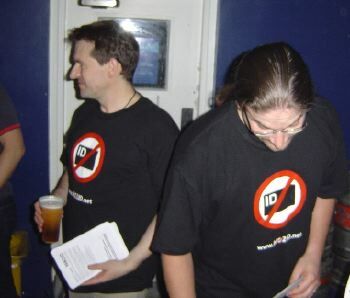 In practice, I think the plain traffic-sign “no2id” shirt does better. It doesn’t even demand prior knowledge of the scheme itself. Wearing it in the streets, I have noticed a lot of part- comprehending looks as people fix on it and don’t slide off. That’s the measure of a poster or other public sign. Many people don’t read on sight, it takes conscious effort of will. And I’ve had a number of conversations starting like the one just now with the girl serving in the Oxfam Bookshop: “I take it you’re against ID-cards, then…” People know what it means, even if (as she was), they are vague about the status of the proposals. Does anyone have a link or a hard-copy reference to the meanings of the various symbols on the shirt? The star and the pink triangle I know, the rest are unknown to me.